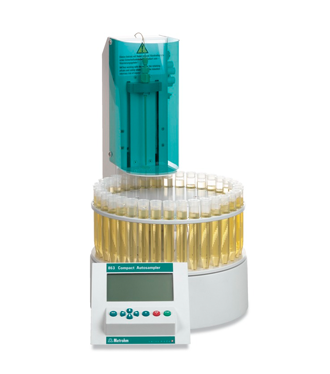 The 863 Compact IC Autosampler is the ideal help for routine analysis. It enables automation of the full range of Metrohm IC instruments. Reduce your amount of manual work, and at the same time watch your accuracy, reproducibility and productivity soar. At K'(Prime) we offer many different Metrohm IC products, to find out more about these systems, please get in touch with us by phone or completing our Contact Form for more information. The 863 Compact IC Autosampler is equipped with a pre-installed sample rack that can hold up to 36 samples simultaneously. Sample volumes between 0.5 and 11 mL can be handled. The entire sample path is metal-free and is suitable for determinations in the trace analysis range up to analyses of aggressive main components. In addition to the pre-installed sample rack, the 863 Compact IC Autosampler is also equipped with a single-channel peristaltic pump, a PEEK sample tube and pre-installed capillaries. 4 methods for sample transfer are predefined in the instrument; these can also be modified. The compact sample changer is distinguished for its very simple operation. This can also be accomplished using the integrated keyboard, in addition to the MagIC Net™ software. Remote control is however also possible via "Remote" signals through existing Metrohm ion chromatographs or third-party instruments. As a result, the 863 Compact IC Autosampler can be used very individually for small-sized tasks in everyday laboratory work.